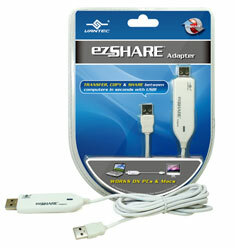 Transfer, copy, and share your files using Vantec's specially designed USB cable with PlugNShare technology! Works on PCs and Macs. Supports Windows 7 and Snow Leopard. Whether you have a PC or a Mac, just connect and you are ready to go; no drivers or software installation is required. Music, photos, videos, and documents�any files can be transferred between computers with just a few clicks. The Vantec ezSHARE Adapter provides the perfect solution for sharing files with friends or transferring data between computers.